Tomsk Polytechnic University's chemists have found a way to avoid producing a large amount of toxic waste during carbon-carbon bond formation. Ordinary water instead of toxic solvents is preferred. New methods have been developed from a long-term palladium-catalyzed reaction study for which the 2010 Nobel Prize in chemistry was awarded. Scientists from the Department of Biotechnology and Organic Chemistry have developed new substrates for "green" cross-coupling reactions. These chemical reactions are among the most common in the world , occurring in any process of organic synthesis. However, the laboratory production of organic molecules has a side effect—a large amount of waste. "Toxic solvents are used in most organic synthesis reactions. They cause the largest volume of waste. Traditionally in the cross-coupling reactions, aromatic halides are utilized as reagents. These materials not only pollute the environment and destroy the ozone layer, but like other toxic substances, they are harmful to human health," says Ksenia Kutonova, assistant at the Department of Biotechnology and Organic Chemistry. The scientists obtained unique diazonium salts—water soluble, stable, safe and halogen-free arenediazonium tosylates. They allow using water as a solvent instead of toxic compounds. The main waste products are water and nitrogen in these chemical reactions. This gas is not dangerous to human health, since we are constantly surrounded by it (the air we breathe consists of about 80 percent nitrogen). Substances created at TPU can be utilized everywhere—in the synthesis of medicines, cosmetics, plastics and monomers for subsequent polymerization. Now, the scientists are modifying methods of using diazonium salts to make organic synthesis more environmentally friendly. This approach is called "green chemistry." Today, scientists around the world seek chemical processes that do less harm to the environment. "Of course, organic chemistry can't be completely safe. But it is in our power to reduce the risk of the use of hazardous solvents. 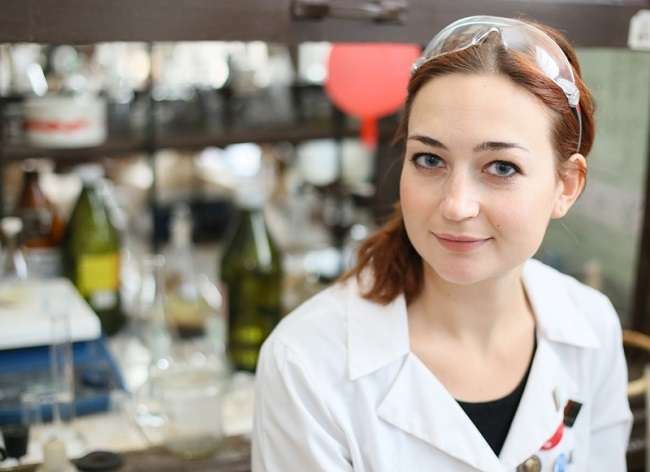 Thus, we try to direct traditional organic synthesis in a new path," says Marina Trusova, research engineer of Department of Biotechnology and Organic Chemistry.